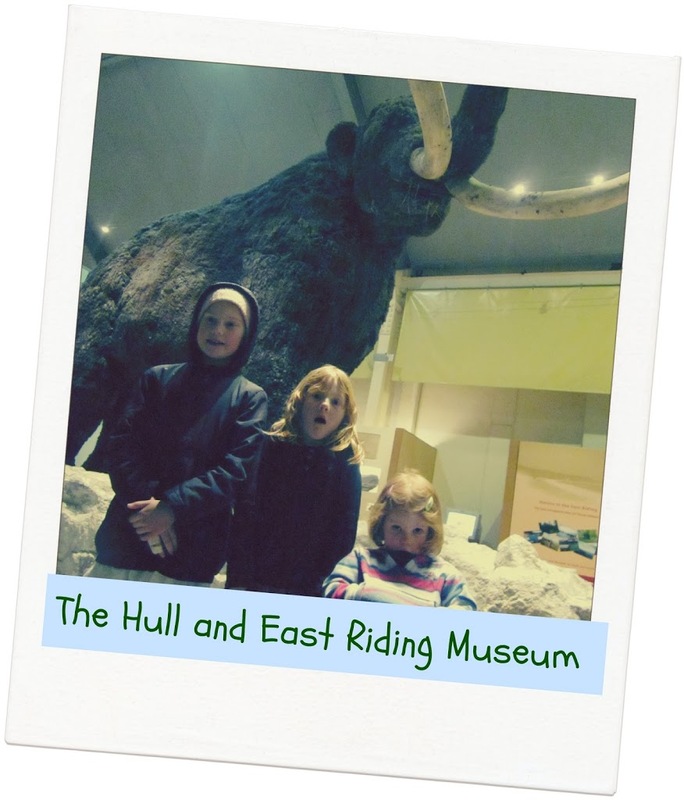 My children know the museum as the woolly mammoth museum, and find parts of it quite scary. 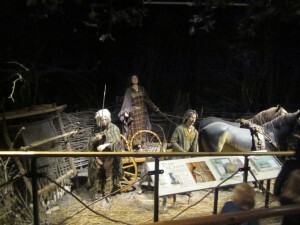 If you want to know about Roman, Pre-Historic, and various other historical periods and how Hull and the East Riding was shaped by the people of centuries past, then the Hull and East Riding Museum is great. 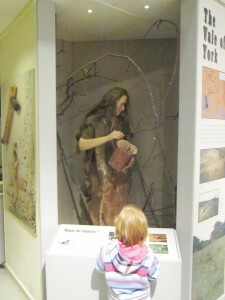 Actually, there’s quite a lot to this museum. There’s loads of information boards, and exhibits of old coins and weapons, and holey bowls dug up in the region. Lots of things. 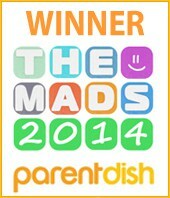 But my children aren’t all that interested in that, so we got round it in about an hour. 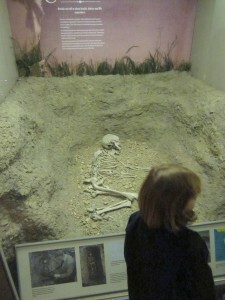 Those with a serious interest in all things archaeology, and without children, should allow more time. 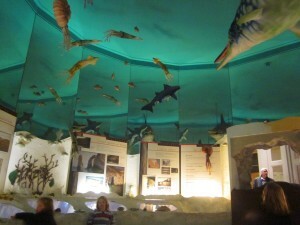 We really liked the pre-historic fish room, with dinosaur-era fish and sharks hanging from the mirrored ceiling. 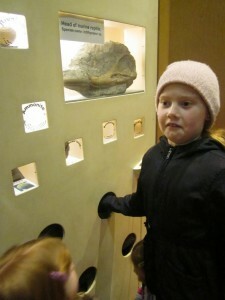 There are also lots of fossils to look at and poke in here. 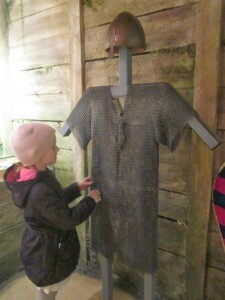 The children, especially the three-year-olds were quite scared of all the ‘pretend people’ as we call them – the models of cave-people, and Saxons, and Romans. We didn’t linger long looking at any of these, though they are pretty cool. There is a bit of an obsession with all things death and burial. I suppose this comes from the inevitable discovery of burial grounds by archeologists. The children asked a few questions, but were surprising less concerned about the ‘skellingtons’ than of the pretend people. 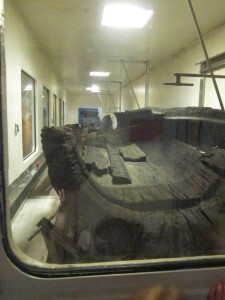 The museum is home to a huge Viking longboat which has been there being preserved by salt water in a tank for as long as I can remember. It was found in the banks of the River Humber many years ago. 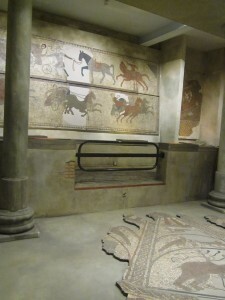 The Roman rooms are very good with lots of mosaics which have been found in East Yorkshire carefully relocated and reconstructed in the museum. 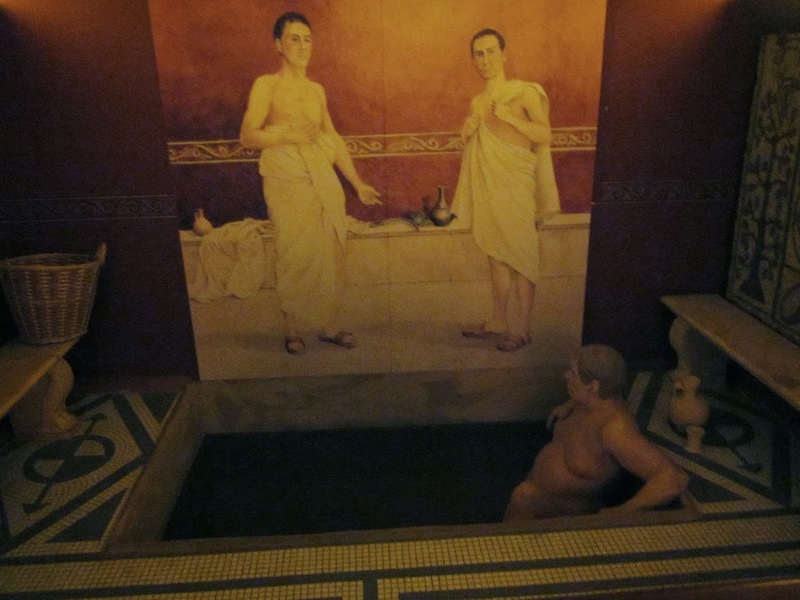 The six-year old was fascinated, but the three-year olds were still scared of the pretend people, and slightly traumatised and baffled by the one in the replica Roman bath. Upstairs (or lift) there is a mediaeval gallery with a collection of weaponry and armour, and a few more pretend people. Then a quick feel in the interactive bits and we’re done! Entry and exit is through the gift shop. There is no pram park so you have to take your pram with you, even if your little ones want to walk round. There are some stairs throughout the museum, but there are lifts where you need them. Opening hours are varied. They don’t open until 1.30pm on a Sunday, so be warned. Please check out the website here for more information. Toilets are located at the entrance/exit and there are at least another set half-way round. Baby changing is also available. 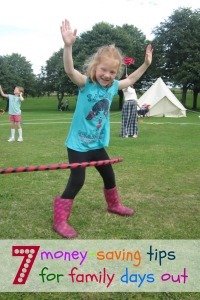 There is exhibition space where activities are run during the school holidays. Again, please check the website for more information. Parking is the usual Hull City Centre arrangements.